II. Country (Provinces–Regions): Australia (Western Australia—Goldfields-Esperance, Great Southern, MidWest, Peel, South West, and Wheat Belt economic development regions; local government areas surrounding Perth). This map area includes all of the Great Southern, Peel, and South West economic development regions, most of the Wheat Belt region, and parts of the Esperance-Goldfields and Mid West regions. Perth and its surrounding local government areas are also included. All of the area is Mediterranean in climate, with winter rains heavy enough to support forests in the southwest. The rains gradually decrease to the inland and northeast, supporting woodlands and savannah. Along the southwest coast is the karri forest (ecoregion AA 1204), made up of tall evergreen eucalyptus trees. Inland is the jarrah forest (1210), also a tree-sized eucalyptus species, and further inland the vegetation grades to a savannah-like eucalyptus and melaleuca shrub area. The Southwest Australia savanna ecoregion (1209) is a wildflower viewing region. Showy flowers of the Proteaceae plant family are common. The region is characterized by winter rains, which create carpets of wildflower displays. The mallee vegetation (1202) is characterized by shrubs with a lignotuber, a storage root that is adapted to sprouting after a fire. To the northeast of the mallee and savannah areas is the eucalypt-mulga line, the boundary between eucalyptus-dominated vegetation and acacia-dominated desert vegetation. The Coolgardie woodlands (ecoregion 1201) of the northeastern Wheat Belt is this transitional desert area. In the early 1900s, the Western Australia government made a concerted effort to allocate large sections of this area east of Perth for farming. The result was the vast ‘wheatbelt’ region that dominates the center of the map. However, these allocations were mostly made west of the rabbit-proof fence. In 1983, land allocations were discontinued, leaving a contrast visible on maps between the cultivated area and vast Mediterranean woodlands to the east (Watson et al. 2008). The rabbit-proof fence itself was conceived as a 2,000-mile coast-to-coast barrier to rabbits, which were overrunning Australia and moving west in the early 1900s. The fence did not serve as a barrier to rabbits, who were found west of the fence shortly after it was completed. Two other barriers were built, one further to the west and another to the north, but they failed to contain rabbits. The rabbit population was later stabilized by diseases. However, the fence did prevent kangaroos and emus from causing crop damage. The fence itself has become famous in studies of global climate change. Following the extensive clearing for agriculture, rainfall over the cultivated areas decreased. However, clouds continue to form to the east of the fence in a noticeable line. From a meteorological standpoint, this is thought to be due to the heterogeneous nature of the native woodland. Forests are taller than crops and tend to change wind speeds in ways that encourage cloud formation, it is hypothesized (http://honeybeesandhelium.com/2012/07/13/the-bunny-fence/). To the west of the rabbit-proof fence is the Wheatbelt, created by the availability of water from the Goldfields Water Supply Scheme (Golden Pipeline). This historic civil engineering landmark and national heritage site transfers water from the Mundaring Weir eastward to the Wheatbelt. The original 560-km-long aboveground structure was completed in 1903 as the first major steel pipeline in the world. It extends from Mundaring Weir near Perth to Kalgoorlie to the east of the map area. Various sites along the pipeline contain museums and interpretive sites, and a bicycle trail follows the pipeline from Mundaring Weir to Northam through the jarrah forest area. 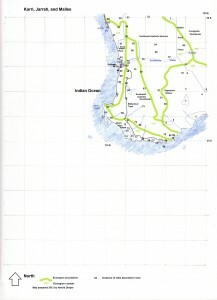 Two other long-distance trails are of note in the map area. The Bibbulmun track is a long-distance walking path from Kalamunda to Albany, a distance of 963 km traversing the jarrah and karri forest regions. The Munda Biddi bicycle trail extends 1,000 km from Mundaring to Albany along a similar, but not the same, route as the Bibbulmun track. Munda Biddi is the longest off-road bicycle trail in the world. A. Coolgardie woodlands (AA1201). This arid area in the northeast of the map area is transitional to desert and supports mallee scrub. Soils are low in nutrients and high in salinity. Low-lying heath shrubs of Eremophila are characteristic. This ecoregion is mostly east of the rabbit-proof fence and contains a predominance of native vegetation. It is considered a biodiversity hotspot. This ecoregion includes parts of the Wheatbelt and Esperance-Goldfields economic development regions. Karroun Hill Nature Reserve, Mid West region (1). Located on the eucalypt-mulga line, this area is an IBA for malleefowl, rufous tree creeper, and regent parrot. B. Esperance mallee (AA1202). East of Albany is a plain with granitic and quartz outcrops which supports shrubby vegetation of mallee and proteaceous scrub. The rabbit-proof fence runs northwest to southeast through this ecoregion, separating a more heavily cultivated area to the west from the great western woodlands to the east. This ecoregion is found in the Esperance-Goldfields, Great Southern, and Wheat Belt economic development regions. Fitzgerald River National Park (NP), Esperance-Goldfields and Great Southern economic development regions (2). This 329,000-acre area consists of a chain of isolated peaks called the Barren Range, an upland plain, a marine plain, and rugged coastal cliffs. The major habitat is mallee heath of Eucalyptus tetragonia and Banksia species. The park is an IBA for Carnaby’s black cockatoo, western bristlebird, malleefowl, western whipbird, and western ground parrot. The park has the largest number of animal species of any area in Western Australia, along with 1,800 plant species, 62 of which are endemic. The major visitor site is Point Ann. Dragon Rocks Nature Reserve, Wheatbelt region (3). This largest remnant of mallee in the Wheatbelt is an IBA for Carnaby’s black cockatoo, malleefowl, and western rosella. Mammals include honey possum and western pygmy possum. Dunn Rock Nature Reserve, Wheatbelt region (4). This mallee shrubland area is an IBA for Carnaby’s black cockatoo, maleefowl, and red-capped parrot. Greaves Road Nature Reserve, Great Southern region (5). The eucalyptus woodland to the northeast of Stirling Range NP is the East Borden IBA for Carnaby’s black-cockatoo. Frank Hann NP, Esperance-Goldfields region (6). Mallee vegetation is found on deep sand plains in this Mediterranean woodland and heathland park. Notable flowers are Banksia and featherflowers. Lake King Nature Reserve, Wheatbelt region (4). This mallee shrubland area is an IBA for Carnaby’s black cockatoo, malleefowl, and red-capped parrot. Lake Magenta Nature Reserve, Great Southern and Wheatbelt regions (7). This 132,000-acre area of mallee provides habitat for malleefowl and six species of mallee-restricted birds—regent parrot, western rosella, red-capped parrot, blue-breasted fairy wren, purple-gaped honeyeater, and western yellow robin. Mulkas Cave, Wheatbelt region (8). This granite outcrop and rock art site near Wave Rock is bigger than the outcrop at Wave Rock and contains 450 stencils and hand prints. Pallarup Nature Reserve, Wheatbelt region (4). This is an area of remnant bushland around a lake and an IBA for Carnaby’s black cockatoo, malleefowl, and red-capped parrot. Stirling Range NP, Great Southern region (9). This 65-km-long mountain range rises to 1,000 m and hosts 1,500 species of plants, making it a wildflower mecca. The open jarrah or wandoo forests feature abundant flowering shrubs, including Darwinia, and 123 orchid species. Six trails lead to mountain peaks which may have snow in winter. There are endemic land snails and mygalomorph spiders. The area is an IBA for Carnaby’s black-cockatoo, western whipbird, and Baudin’s black-cockatoo. Wave Rock, Wheatbelt region (10). This 15-m-high rock formation near Hyden appears to be a crashing wave and is multi-colored. Welsh Nature Reserve, Wheatbelt region (11). This area of mallee grading into acacia shrub is the Holleton IBA for malleefowl, rufous tree creeper, and blue-breasted fairy wren. C. Jarrah-Karri forest and shrublands (AA1204). This is the forest of wetter areas of southwestern Australia and is found on a narrow belt along the coast from Albany west to Margaret River. The wettest forest is of karri, or Eucalyptus diversicolor, which is an evergreen and the third tallest tree in the world, growing to 90 m. Karri trees live 350 years. Flowering karri trees attract purple-crowned lorikeets to feed on nectar. As rainfall and nutrients decrease inland, jarrah forests (Eucalyptus marginata) and marri forests (Eucalyptus calophylla) are found. The flora and fauna is highly endemic. There are endemic pitcher plants, frogs, worms, and crayfish. This ecoregion is found in the coastal areas of the Great Southern and South West economic development regions. The Karri Forest Explorer Drive near Pemberton, South West region, highlights tall karri trees (up to 90 m) and passes by Beedelup NP,Big Brook Forest, Gloucester NP, and Warren NP. The westernmost karri forest is in Leeuwin-Naturaliste NP. Beedelup NP, South West region (12). Located on the Vasse Highway west of Pemberton, the park contains lush karri forest and a waterfall. Understory plants include peppermint (Agonis), Darwinia, and Acacia. The park is on the Karri Forest Explorer Drive. Brockman NP, South West Region (13). Located between Pemberton and Northcliffe and adjacent to Warren NP, the park has karri and marri forest. West Cape Howe NP, Great Southern Region (14). Trails lead to the southernmost point in Western Australia. There are black cliffs and habitat for the Albany pitcher plant. The Bibbulmun Track traverses the park. D’Entrecasteaux NP, South West Region (15). Stretching along the coast for 130 km from Augusta to Walpole, this 117,000-ha park has coastal cliffs, sand dunes, wildflower heaths, and karri forest. The mouths of the Donnelly, Gardner, Shannon, and Warren Rivers are in the park. Visitor sites include the Yeagarup Dunes, 10 km in length; Point D’Entrecasteaux, with limestone cliffs; Mount Chudalup, a large granite outcrop with karri and marri forest; Black Point basalt colunns; and Mandalay Beach. Mandalay Beach contains the wreck of a Norwegian ship dating to 1911. The Bibbulmun Track crosses the area. Sandy Island, three km off the southern coast of the park, is covered with tussock and grassland and is an IBA for the flesh-footed shearwater and fairy tern. Eclipse Island Nature Reserve, Great Southern Region (16). This island is an IBA for flesh-footed shearwater, great-winged petrel, and little penguin. Mount Frankland NP, Great Southern and Southwest regions (17). This 31,000-ha area of karri, jarrah, and tingle forest has walking trails that lead to the summit ofMountFrankland. Gloucester NP, South West Region (13). Located 3 km from Pemberton, a 60-m-high karri tree was used as a fire lookout tower. At The Cascades, a stream flows over rocky shelves. The park is on the Karri Forest Explorer Drive. Gull Rock NP, Great Southern region (18). This park includes the Mount Martin Botanical Reserve, the most significant remaining stand of scarlet banksias. Leeuwin-Naturaliste NP, South West region (19). The coastline between Cape Naturaliste in the north and Cape Leeuwinin the south is included in this park, which includes sea cliffs, granite headlands, waterfalls, and caves. Canal Rocks are coastal granite rock formations separated by ‘canals.’ The westernmost karri forest is at Boranup. Commercial cave tours are of Ngilgi, Mammoth, Lake, Moondyne, and Jewel caves, while self-guided tours are available at Calgardup and Giants caves. The 140-km Cape to Cape Walk Track is entirely within this park. Inland is the Margaret River wine region. Mount Manypeaks Nature Reserve (20). See Waychinicup NP. One Tree Bridge Conservation Park, South West region (21). Located on the Donnelly River south of Manjimup, this park contains four karri trees that are over 400 years old. Owingup Nature Reserve, Great Southern Region (14). Home of a rare orchid, Diiuris drummondii, the swamp and boat harbor wetlands are an IBA for the Australasian bittern and other waterbirds. Scott NP, South West region (22). This is an access area to the Blackwater River, which is popular for canoeing. Shannon NP, South West region (23). The entire watershed of the karri-forested Shannon River is included in this 53,500-ha park, which is adjacent to the east side of D’Encastreaux NP. The Great Forest Trees Drive includes old growth forest. The Bibbulmun Track crosses the southern parts of the park. Torndirrup NP, Great Southern region (18). This 4,000-ha coastal area just south of Albany features a natural bridge and blowholes along the coast, with coastal heaths and granite outcrops. The coastal areas are known for freak waves. Two Peoples Bay Nature Reserve (20). This area between Gull Rock NP and Waychinicup NP provides habitat for 12 rare animals, including noisy scrub-bird, western bristlebird, and Australasian bittern, as well as the mammals Gilbert’s potoroo, western ringtail possum, and quokka. The reserve is an IBA for noisy scrub-bird, western bristlebird, and western whipbird. Walpole-Nornalup NP, Great Southern and South West regions (24). Large karri and tingle trees are a highlight of the flora, which also includes coastal heath and 104 species of orchids. The red tingle tree is endemic to the park. The Bibbulmun Track traverses the park. Notable visitor areas are Circular Pool on theFranklandRiver, the Knolls, Conspicuous Cliffs, Hilltop with a giant tingle tree, andMountClare. Warren NP, South West region (25). Downstream from Gloucester NP and upstream from D’Entrecasteaux NP on the Warren River, this park has virgin karri forest with 60-m tall trees along theWarrenRiver. Fire lookouts are in trees that can be climbed. A 10-km trail winds through the old growth. TheWarren River is a canoe stream. The park is on the Karri Forest Explorer Drive. Waychinicup NP, Great Southern region (20). Located on both sides of Mount Manypeaks Nature Reserve, this park has the granite-lined outlet of the Waychinicup Riverand rare mammals—quenda, western ringtail possums, and quokkas. Rare birds include the noisy scrub-bird and western ground parrot. The park is an IBA for noisy scrub-bird, western bristlebird, and western whipbird. William Bay NP, Great Southern region (26). Located south of Denmark along the coast, the park is composed of granite headlands vegetated with heath vegetation. There are pockets of karri and extensive tracts of peppermint (Agonis). Granite boulders and rocky shelves extend offshore. Sheltered swimming areas are at Greens Pool and Elephant Rocks. Yelverton NP, South West region (27). Located at the junction of three ecoregions, this park contains native forests with a high concentration of rare flora. D. Swan Coastal Plain (AA1205). Found along the west coast from north of Perth to Cape Naturaliste, this area has diverse vegetation of Kwongan scrub, mallee, and heath. Tuart forests (Eucalyptus gomphocephala) grow south of Perth. Up to three fourths of the world’s carnivorous sundew species are found in this ecoregion. Some wildflowers are pollinated by possums. This ecoregion is found in the Mid West, Peel, South West, and Wheat Belt economic development regions and includes the local government areas around Perth. Australian Convict Sites, Freemantle local government area (28). This area on the Swan River downstream from Perth memorializes the last of the original convict prisons to close. About 166,000 people were sent to Australia from 1787 to 1868. Of this, 10,000 were sent to the Swan River Colony in today’s Western Australia. These convicts worked on public infrastructure, agriculture, and mining. The prison consists of a complex of limestone buildings within a six-meter-high limestone perimeter wall. On site are 17 intact convict-built structures. Becher Point Wetlands, Rockingham local government area (29). This system of wetlands and dunes supports sedgelands separated by sand ridges. Sedgelands are dominated by Baumea species. Forestdale and Thomsons Lakes, Armandale and Kwinana Local Government Areas (28). These lakes are the best remaining examples of brackish seasonal lakes with fringing sedges in the Swan Coastal Plain and support 20,000 ducks and the Australasian bittern. Thomsons Lake is one of 19 lakes in Beeliar Regional Park. Peel-Yalgorup System, Peel and South West regions (30). Shallow estuaries and lakes support 86 species of water birds, including thousands of shorebirds. The area is known for samphire vegetation of sedges fringed by low trees of Melaleuca. In the water are thrombolites, similar to stratomalites, formed by cyanobacteria and sediments. 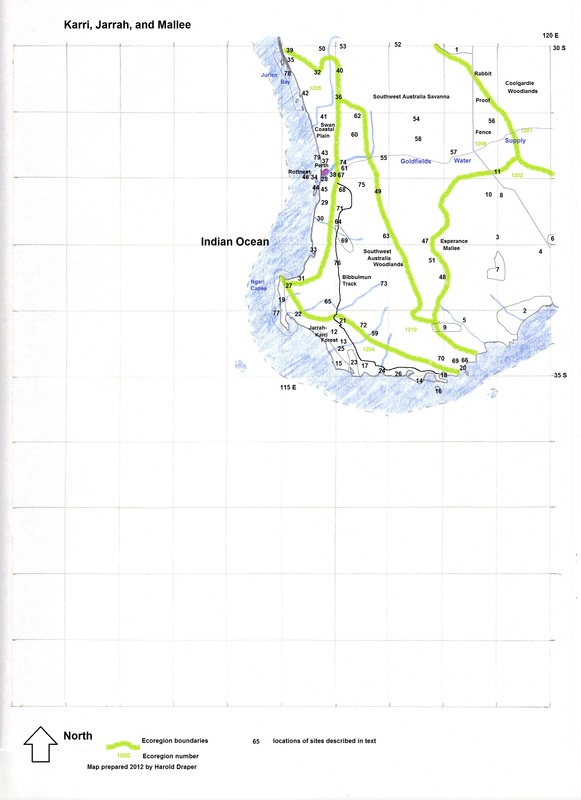 It includes Yalgorup NP, Peel Inlet, Harvey Estuary, Lake McLarty, Lake Mealup, and Erskine Conservation Park. Yalgorup NP extends from the Peel-Harvey estuary south to Harvey and includes a chain of ten lakes. Lake Clifton within the park is known for thrombolites, microorganism-derived structures similar to stromatolites. The NP is an IBA for the fairy tern, hooded plover, and Australian shelduck. Mammals include the chuditch, southern brown bandicoot, and western ringtail possum. The Peel-Harvey Estuary is an IBA for the fairy tern, blue-billed duck, and red-necked stint. Lake McLarty Nature Reserve is an IBA for red-necked stint, sharp-tailed sandpiper, and black-winged stilt. Vasse-Wonnerup System, South West region (31). This is an extensive shallow wetland system supporting a breeding colony of black swan. It includes Tuart Forest NP and Vasse-Wonnerup Conservation Park. Badgingarra NP, Mid West Region (32). High breaks overlook sandplains in this park adjacent to the Brand Highway. Flowers include yellow and black kangaroo paw, grass trees, banksias, and Badgingarra mallee. Beeliar Regional Park, Melville, Cockburn, and Kwinana local government areas (28). Two chains of wetlands and 19 lakes are in this park area from 10 to 33 km south of Perth;Thomsons Lake is a Ramsar site. Benger Swamp, South West region (33). This area is a seasonally inundated marsh which is an IBA for Australasian bittern and blue-billed duck. Canning River Regional Park, Canning local government area (28). This 6-km stretch of river in the City ofCanning is nine km southeast of Perth. It is known for canoeing. Carnac Island, between Garden and Rottnest Islands(34). This small limestone island is an IBA for fairy tern. It is covered with acacia woodland and contains sea cliffs and attracts sea lions. Cataby, Wheatbelt region (32). This area of eucalypt woodlands on theBrand Highway is an IBA for Carnaby’s black-cockatoo and western corella. Drover’s Cave NP, Mid West Region (35). Numerous caves are found underlying the Banksia-dominated flora east of Jurien Bay. The park is part of the Kwongan sand plains area of outstanding floral diversity. Gillingarra Nature Reserve, Wheat Belt region (36). In the Victoria Plains, Carnaby’s black-cockatoo nest in marri trees. This is an IBA for the Carnaby’s black cockatoo, western corella, and red-capped parrot. Herdsman Lake Regional Park,Stirling local government area (37). The largest wetland in the Perth area is 7 km northwest of the city and contains a wildlife education center. Honey Myrtle Swamp, Wheat Belt region (35). This large wetland near Jurien Bay is notable because it is dominated by honey myrtle, or Melaleuca huegelii. Jandakot Regional Park, Armadale, Cockburn, and Kwinana local government areas (38). Located on a dune system, this park protects a Banksia woodland 17 to 34 km southeast of Perth. Leschenault Peninsula Conservation Park, South West region (33). This beach area is north of Bunbury and is known for bird and dolphin watching. LeSueur NP, Mid West Region (39). This wildflower area inland from Green Head is known for acacias, hibbertias, melaleucas, orchids, and kangaroo paw. Jarrah grows here but takes the form of a mallee shrub. Mount LeSueur is a mesa; much of the rest of the park is the northernmost area of the Swan Coastal Plain. The park is part of the Kwongan sand plains area of outstanding floral diversity. Moora area, Shire of Moora, Wheatbelt region (40). The area around the town is an IBA for Carnaby’s black-cockatoo and western corella. Moore River NP, Wheat Belt region (41). This wildflower area north of Perth is known for Banksia heathlands. Nambung NP, Wheat Belt Region (42). This coastal park contains beaches, coastal dunes, tuart trees, and heathland that puts on wildflower displays. The park is part of the Kwongan sand plains area of outstanding floral diversity. The Pinnacles Desert is an area of limestone pillars three m high that rise above sand dunes. Wildlife includes the western grey kangaroo. Neerabup NP, Wannaroo local government area (43). This undisturbed coastal plain area north of Perth is known for huge balga trees. There are also patches of jarrah forest. It is part of the Northern Swan Coastal Plain IBA for Carnaby’s black-cockatoo, western corella, and red-capped parrot. Penguin Island Conservation Park, Rockingham local government area (44). An island in the Shoalwater Islands Marine Park supports a colony of little penguins. It is accessible by ferry and includes walking trails. Rockingham Lakes Regional Park, Rockingham local government area (45). Adjacent to Shoalwater Islands Marine Park, this area is known for thrombolites and includes Cape Peron. Rottnest Island, Rottnest Island Authority, off ofPerth(46). This 11-km-long island is most known for the globally threatened mammal, the quokka. It also contains six permanent salt lakes and is an IBA for fairy tern, banded stilt, and wedge-tailed shearwater. Offshore the island is a notable area for watching whales and dolphins and for snorkeling. Tuart Forest NP, South West region (31). Between Capel and Busselton is the 2,000-ha park with trees to 33 m in height. The endangered western ringtail possum is protected in the park. The park is part of the Busselton wetlands IBA for banded stilt, rednecked avocet and Australian shelduck. Vasse-Wonnerup Conservation Park(31). See Vasse-Wonnerup Ramsar site. Woodman Point Regional Park, Cockburn local government area (28). Located 20 km south of Perth on the coast, this area contains remnant tuart woodland and Rottnest cypress. Yalgorup NP, Peel and South West regions (30). See Peel-Yalgorup Ramsar site. Yanchep NP, Wanneroo local government area (42). This park north of Perth on the coast has tours of Crystal Cave. There are 600 other known caves in the park. The forest is tuart and banksias, which area accessible from an extensive system of walking trails. The park is known for the western grey kangaroo and koalas, as well as Carnaby’s cockatoo. It is part of the Northern Swan Coastal Plain IBA for Carnaby’s black-cockatoo, western corella, and red-capped parrot. Yellagonga Regional Park, Joondalup and Wanneroo local government areas (43). This inland area 20 km north of Perth contains wetlands and upland vegetation. A walk trail links Joondalup and Yanchep NP.